In less than two decades, the ideas of the Protestant Reformation have grown from one man’s crusade to reform the church, to a revolution that sweeps through Europe in the 1530s. At the same time as Protestant ideas are inspiring violence in England, another reformer is leading his own radical charge in Switzerland. His name is John Calvin. Calvin is initially inspired by his contemporary Martin Luther, but the two reformers are very different men. John Calvin is born in France in 1509 and educated in the law and humanities. He managed to break free from the Roman Catholic Church at around 1530. After religious tensions started in France against Protestant Christians, he fled to Basel, Switzerland. Like Luther, he finds a more spiritual calling. Here in the cold mountain air of Geneva, the school of Protestantism that emerges from Calvin’s teachings is a harsh, uncompromising faith. Calvin’s reforms include perhaps the most radical difference between his beliefs and Luther’s, called predestination. Predestination means that of all the people on Earth, God has chosen a lucky few, called the Elect, who will be saved. Those who are not in the Elect will be damned for eternity. In Calvin’s doctrine, no amount of good works by an individual can force God to change his holy mind. In Luther’s teaching he starts with God is gracious, and then he has to back up and figure out if God is determining this. Calvin starts on the other hand; God determines everything and then is gracious. But predestination put Calvinists in a terrible bind. They earn to find some way to know whether they are part of the elect, destined for Paradise or not. While Calvin and his followers reject the Old Catholic notion that good works can provide salvation, they come up with a new idea: that good works might demonstrate if you are among the elect to be saved. Calvinists were by far the most activist of any Protestants. They were always busy doing God’s work and in their sense they were proving that they were elect. In the world of work, Protestants find an answer to their painful spiritual predicament. The harder Calvinists work, the more likely they are to prosper. The more they prosper, the more convinced they become of their own salvation. 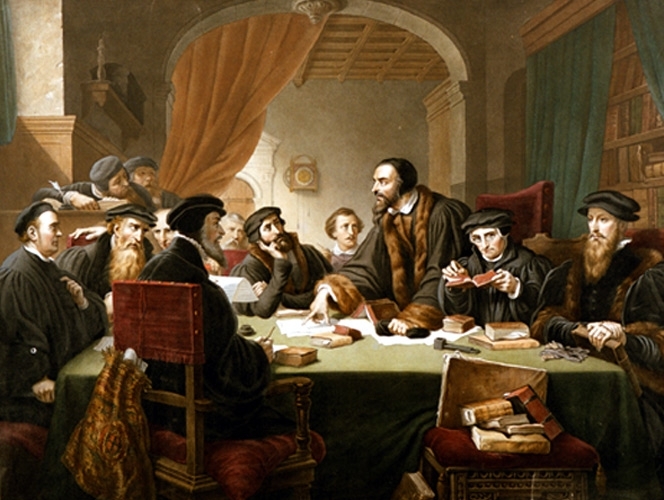 Calvinism begins to compete with Lutheranism within the Protestant community. Calvin died at the age of 54, on the 27th of May 1564. Due to so many followers that wished to see his grave, he was buried in an unmarked grave in the Cimetière des Rois. During the 19th century, a stone has been added to mark a grave thought to be Calvin’s. About the author: Bogdan U. View all posts by Bogdan U.
MBA gradute in geography, passionate about history, politics and patrimony. Motivated to provide transparent and justified opinions through my articles. Copyright © 2013-2015 - HistoryConflicts.com - All rights reserved.